Power metal can often be classified into two distinct categories: pre-Helloween and post-Helloween. The former category developed out of Dio-era Rainbow and Iron Maiden/Judas Priest influences, whereas Helloween ramped up the tempos and injected some speed/thrash action into their style, along with positive/uplifting melodies and choruses tailor made for unison audience support. 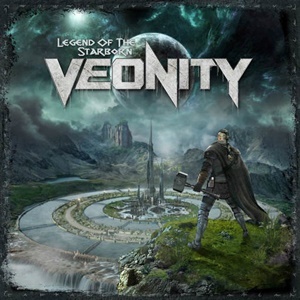 Veonity hail from Sweden and since 2013 aim to keep that Helloween-ish/ European power metal model alive, releasing two albums Gladiator’s Tale and Into the Void before returning for the third full-length Legend of the Starborn. Familiarity with the expectations of the genre can lead to a certain ‘cheeky’ cliché atmosphere – yet in the end, if the songwriting and performances rise to the occasion, that’s all that really matters, right? Delivering a pure aural outlook with guitars, bass, and drumming carrying the workload instead of overflowing orchestration, the band can easily switch from a speedy, double bass fueled opener like “Rise Again” into something more traditional and epic in atmosphere for the follow-up “Starborn” – the guitar work of Samuel Lundström highly magnetic in it’s slower, melodic textures for the latter track. The production values possess that outer galaxy / Iron Savior vibe – and there are a couple of special guests like Sabaton’s Tommy Johansson providing a vocal assist during “Winds of Asgard” and Bloodbound singer Patrik Johansson on “Freedom Vikings”. The guitar hooks are huge and abundant – the type Helloween, Sonata Arctica, and other German ilk live and die by – check out “Gates of Hell” and “United We Stand” for sterling execution of the highest axe magnitude, both on a power/speed level as well as in ballad form. The personal nature to Anders Sköld vocals keeps Veonity in a wider appeal bracket than most power metal bands. His melodies occasionally have that Swedish accent seeping through – but his ability to move from a lower range in the verses to piercing falsettos during the chorus of “Outcasts of Eden” proves he’s not a mere one-trick pony. Fantasy, science fiction, and mythology/ battle lyrical content aren’t surprising either – the themes of Vikings and warriors go hand in hand. If there’s one complaint to be had – the record in its natural state sans the “Beyond the Horizon” bonus track clips 70 minutes of content – tougher to digest in one setting unless you are on a significant road trip. 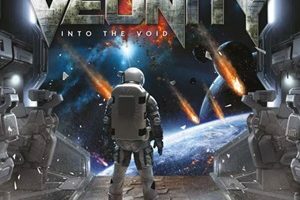 In the end, veterans of power metal rejoice in an act like Veonity that flashes the right mixture of speed, power, mid-tempo anthems, and occasional reflective ballad to remind us of why the genre endures and keeps listeners pumped for the next Helloween, Stratovarius, and Iron Savior outings.